November 9 is an important date in German history for a number of reasons, but today we are commemorating an era-defining moment: the fall of the Berlin Wall exactly 20 years ago. In the weeks leading up to November 1989, both Hungary and Czechoslovakia had relaxed their border controls, and thousands of East Germans fled to the West through those countries. With the division between West Germany and the DDR1 fatally weakened, the decision was taken to open the border that had been effectively sealed for 28 years. This was supposed to take place on November 17, but at a press conference on November 9 a government spokesman mistakenly announced that people were free to cross “immediately”. Berliners from both sides flocked to the wall, outnumbering the bewildered border police who at this stage didn’t know what was going on, and of course the rest is history. The Brandenburg Gate was a symbolic focus for the fall of the Wall. During the Cold War, the gate was isolated in the “death strip” between two walls – the main outer barrier, facing the west, and a smaller inner one. Today, the Brandenburg Gate sits at the heart of the reunited city2 and the exact position of the wall is marked by a line of cobblestones set into the road. Cobbles aside, there’s virtually nothing of the wall left to see here, so the rest of this post will search out a few of the places where it – or its legacy – can still be seen. We begin in the north of the city, in the district of Pankow. Here, the “death strip” clearly stands out as a sea of trees that have grown up since the border guards left. A few small sections of wall also still exist here, and, a little way to the south, a few very overgrown Blumenschalensperre – barricades disguised as concrete urns filled with flowers. Also still visible in many places is the track that was used to patrol the border. One of the best preserved sections is beside Schulzestrasse, where the tall lamp posts that originally illuminated the “death strip” can clearly be seen. At Bernauer Strasse, the border was formed by the walls of the buildings on the southern side of the street – the apartments were in East Germany; the street itself was in the West. Consequently, it was the scene of many escape attempts. To prevent this, the authorities first bricked up the windows and finally evacuated the residents and demolished the buildings along the border. Today, its southern side still largely empty, Bernauer Strasse is home to various memorials to the wall. The Chapel of Reconcilation was opened in 2000 on the site of a former church, which was isolated in no man’s land for years before being demolished in 1985. Just across the street is the Berlin Wall Documentation Centre. 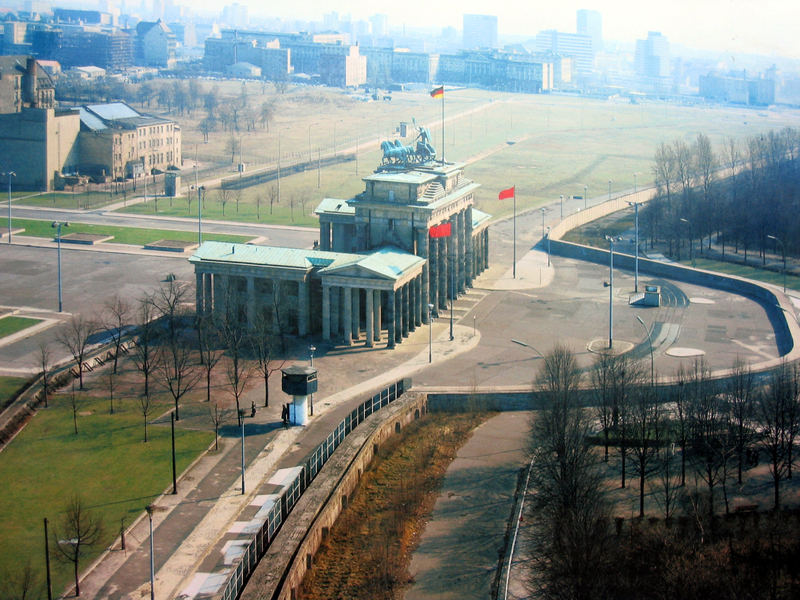 Nearby, the border twists and turns so that near the Nordbahnhof station, West Berlin is actually east of East Berlin! Again, a few stretches of wall are still visible – these were part of the “hinterland wall”, the smaller barrier behind the main wall. The longest stretch of wall still standing is known as the East Side Gallery, and we’ve featured it before. The imagery has improved somewhat since then, although of course it’s still much better appreciated from ground level! There’s another well preserved length of wall on Niederkirchnerstrasse, not far from the infamous Checkpoint Charlie (although the checkpoint you can see today is only a reconstruction). Our last stop in Berlin is something of an oddity. Steinstücken, a community of about 200 people in the southwest of the city, was once an exclave of the West, entirely surrounded by the DDR. Once the wall was built, its inhabitants were entirely cut off, and could only visit the rest of West Berlin by passing through two East German checkpoints on each visit. This situation lasted for 10 years before a thin sliver of land was exchanged, attaching the exclave to the rest of West Berlin. Although the wall is long gone, the border between Berlin and Brandenburg still follows the same convoluted path today, including the strip barely 20 metres wide. Although Berlin was the most famous divided German community, it wasn’t the only one. The border between East and West Germany also cut through other, smaller towns. Among them was the village of Mödlareuth, which is divided between Bavaria, in the West, and Thuringia, in the East. The wall was built here in 1966, five years after that in Berlin, and a small part of it has been preserved as an open-air museum, complete with a helicopter and some tanks. As you can probably gather, there are a huge amount of wall-related things to see in Berlin, and we could fill dozens of posts with them. Fortunately, a superb German site does a far better job than we would, with a vast store of photos, maps and other information, accessed through a Google Maps interface. It’s only available in German, but there’s plenty to look at even if you can’t read the text. Also check out the fascinating “Wall Traces” section at Berlin’s official website. Thanks to fellow GSS authors Jenni and Cédric for respectively suggesting and contributing to this post. Just a quick note to point out that Berlin was not, as the post suggests, on the border between East and West Germany, but was rather an outpost of West Germany surrounded on all sides by East German territory. The city (being the capital at the time) was divided among the allies just as the rest of the country had been, despite the fact that Berlin was well east of the Soviet territory border. That’s why the capital of West Germany was moved to Bonn until the after the collapse of East Germany. I didn’t mean to imply that Berlin was on the main East/West border, but of course the Berlin border was still, politically, a boundary between West Germany and the DDR. The village of Mödlareuth, which I also mentioned, was on the main East/West border, nowhere near Berlin. I saw a piece of the Berlin Wall at Expo ’92 in Seville. It was, as you’d expect, a horrible piece of concrete with graffiti all over it. But I wonder why they keep those pieces now? And here comes the Boston Globe’s Big Picture. Note the clickability of many of the images for “then and now” comparisons.